The 1991 series still holds a special place for me as a collector. 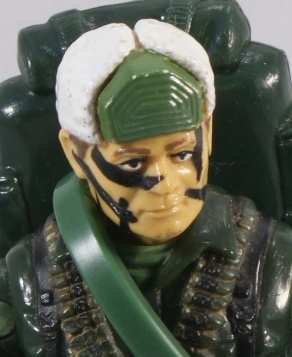 It was the first set of figures I encountered upon re-entering the world of GI Joe. When checking out the cardbacks, I was excited to see not only some old favorites newly redesigned, but also some new faces. Big Ben was an immediate standout. The head sculpt in particular impressed me. There’s a a lot of character in his stoic face. Ben here is a figure whose body mold and accessories were plundered time and again during the later second o-ring generation. How many times did he get reused? Well, there were several more versions as himself, and bits of him were reused in various comic packs. His machine gun was included with fifteen different figures from 2000 to 2006. The backpack appeared six times during the same period. Even the satchel and grenades showed up a few times. Wow. Big Ben’s usefulness has been somewhat limited for me. The bundled up nature of his uniform made a great arctic repaint years later, and he always generally looks good in cold weather situations. However, he seems out of place in some other environs, which is a shame, since he’s the team’s SAS operative. I’d like to throw him into some desert ops, or a jungle theater sometime. He made a few appearances in the DIC animated GI Joe series, and of course he was outfitted in his heavy jacket and hat, despite the locale. If you’d like to experience Ben in animated action, check out the episode General Confusion, in which the Joes are the victims of budget cuts, and Big Ben gets all hot and bothered over an attractive US Senate budget specialist who turns out to be…well, I’ll give you two guesses who she really is. While Ben has been re-released in o-ring format enough times, he’s not had a reinterpretation. 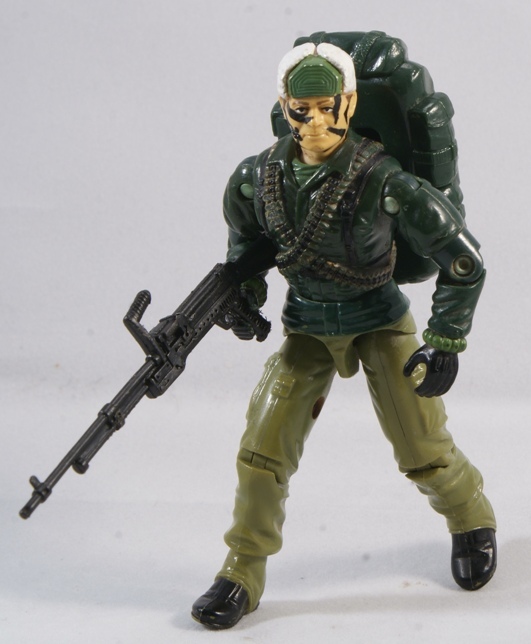 Something along the lines of the Palitoy Action Force SAS trooper would have been a welcome change. Maybe with some recent attention for the 90s from the Collectors Club, we’ll see a modern style Big Ben show up. I’m ready for one, as long as he doesn’t wear out his welcome again. I finally got this figure in 2012, though my very first Big Ben was the International Action Force version. Funny thing is, on the head, the paint masks are the same (except the hats). I have Bigben and his pack. I’m missing his rifle, satchel and grenades. Still; he was in good shape for being a swap meet find. I have also procured several other “Dic” regulars the past couple of days. Big Ben is still one of my favorites from what turned out to be a very great year. I guess that’s why I didn’t mind Hasbro revisiting the mold and weapons so often. Rock “N” Roll for one, strongly benefited from him, as did Schrage from the Oktober Guard. Those are two sweet figures which wouldn’t have happened if not for Ben. I would like the club or some other authority to issue an updated version, but Big Ben is one of those figure which reminds me why the o-ring era was so versatile and influential a force back in its day in a way that the modern era just can’t match. And also Calculon and Morbo. I also heard he had recodred lines for Scamper [Metroplex’s tank drone] but they never made it to air. I’m also guessing he was the voice of Orson Well’s head in one of the later Futurama episodes. I’ve never actually seen the critic. I know there was a simpsons crossover episode. So i might have to find the series and watch it one day. He was. And he didn’t voice Scamper, he voiced Six-Gun, another Metroplex drone (and his lines did make it). He didn’t just voice Orson Welles’ head–he’s actually famous for his overall Orson Welles impression. He based the Brain on the guy, and he dubbed over Vincent D’Onofrio when he played Welles in “Ed Wood”. And of course, you definitely should see The Critic, two episodes took great potshots at him. All the episodes are on youtube. Having many of the second generation Big Ben figures prior, I found the original Big Ben to be my favorite. Another international ‘Joe to add depth to adventures! Even though, back in 2000, 01. 02, and so on, I could have cared less about another Big Ben. Or Mirage, even though that’s a solid figure, too. Getting back to the figure. I also have the spy troops version. I thought it and the little tank thingy he came with were a bit of a swing an a miss. I picked up an extra one though and attempted to turn it into a Patton figure but it didnt look right. But you know who does make a good base for a Patton figure? R.O.C Destro. Now all i need to do is find an appropriate helmet for him. Big Ben never had a bad version. The Road Rebel one with his head on Hawk’s body was the worst, but that’s due to minimal paint ops. What was annoying was his machine gun always been reissued without the bipod. IIRC, carded sample existed of the 2000 version with the bipod included. 1991 was a great year. Several great figures that tend to not get the attention they should simply because the 3rd digit in their year is a 9. I found Crimson Guard Immortal & Desert Scorpion the most eyecatching but Big Ben and most others looked quite good too (Grunt was the only ugly one, though we now know why Clean Sweep wears a full head cover). I’m a Big Ben fan. A kid down the street had him and I got to use him when I babysat. He was one of the first figures I tracked down as a adult. The arctic repaint was great. But, the 2002 figure was great, too. Had he not been packed with Alley Viper and become the bane of collector’s existence at the time, I think that figure would be more appreciated. Heck, I wouldn’t have minded another Big Ben repaint or two…. I loved the figure from the get-go and the fact that he came with grenades sure didn’t hurt! Anyone ever read “biggles” adventures? Does the Monty Python skit count? Great figure! I only collected 82-90 as a kid, so I never got Big Ben until a couple years back. He quickly became a new favorite. The grenades are an awesome accessory.